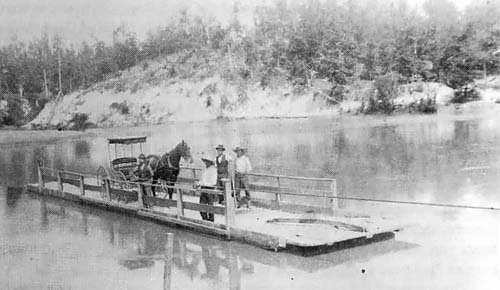 THE FERRY AT LOWERY'S LANDING, THE ONLY MEANS OF CROSSING THE HATCHIE RIVER. WERE SHIPPED AND THEN TRANSPORTED BY OX CART TO THEIR FINAL DESTINATION. LANDING THE SUPPLIES WERE TRANSPORTED BY OX CART TO DANCYVILLE.